This routine has multiple effects. 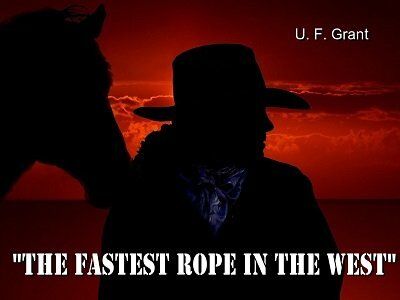 You begin with a length of rope...showing it freely. Instantly a knot appears on one end. You clearly untie it, but a moment later another knot appears. You clearly untie it again but...yes you are right...another knot appears. You repeat this effect again and again. At the end you have snapped five knots in all. Now you borrow a finger ring and execute Grant's "Poor Man's Monkey Bar" in which you tie three knots on the rope with the ring knotted to the one on the right. Then you put the rope behind your back and pretend that the ring "magically" pass on to the left knot... You repeat the "trick" in reverse bringing the ring to the right knot again. Your audience is perplexed as they understand that you have simply inverted the ends of the rope...But, wait, a moment later you VISIBLY make the ring jump in the center knot! For the final you make the ring again visibly jump on the end knot and give all for examination. The danger of this routine... is that you will like it so much that it will became one of your favorite ones. One that you can execute impromptu at any time when you have a length of rope and a ring.